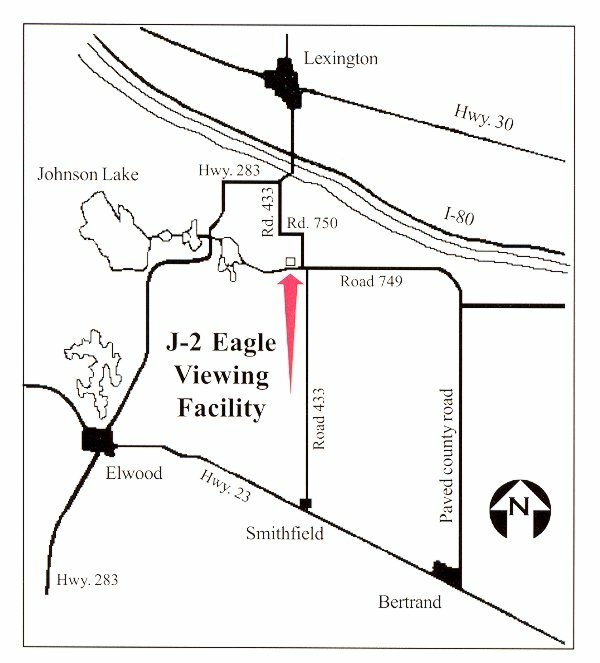 Central’s Eagle-viewing facility at the J-2 Hydroplant is closed for the season. The facility will re-open in late December 2019. 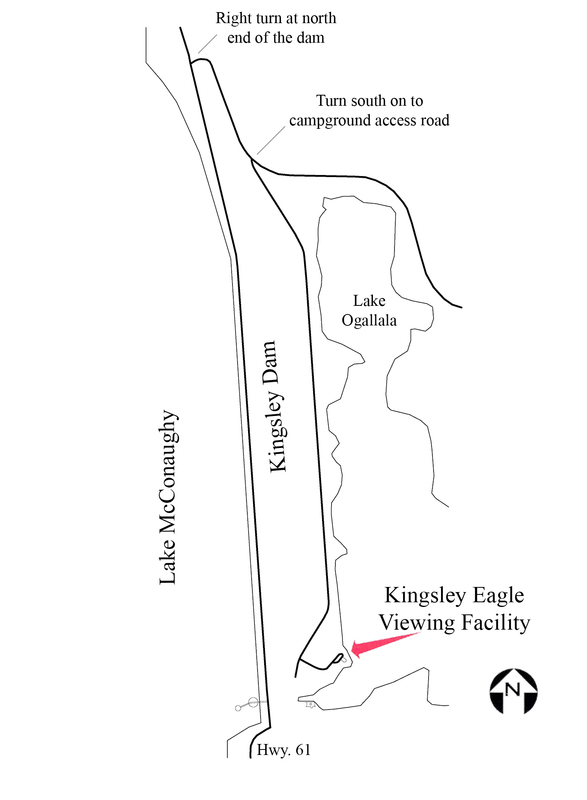 The eagle-viewing facility at Kingsley Dam is closed for the season. The facility will re-open in late December 2019. The bald eagle has always captured the attention of Americans, so much so that in 1782 the Continental Congress chose the eagle as the national bird and the centerpiece for the nation’s Great Seal. Over the years, the bald eagle acquired its status as a symbol of freedom and of the United States. Interest in bald eagles has grown in recent years, partly because of the birds’ plight. Their numbers drastically declined during the late 1940s and 1950s when the use of pesticides such as DDT and Dieldrin was common. The eagles ingested the pesticides by eating contaminated fish and waterfowl. The pesticides interfered with the eagles’ reproduction by causing the shells of the birds’ eggs to be abnormally thin and susceptible to breakage. High levels of pesticides which concentrated in adult birds were also usually fatal. Most wildlife experts agree that banning DDT was the single most important factor in the birds’ recovery. From a low point of less than 3,000 bald eagles in the lower 48 states, present estimates show more than 9,000 nesting pairs. The number of immature birds, not included in the estimate, increases the population of bald eagles to an even greater number. The ban on the general use of several pesticides — including DDT in 1972 — new laws protecting the eagles and efforts to reintroduce eagles into their former range has helped the birds regain lost ground and increase in number. In fact, the population increase was such that the U.S. Fish and Wildlife Service removed the bald eagle from the endangered species list in 1995. In June 2007, the bald eagle was removed from the list of threatened and endangered species. The species continues to increase in number and no longer is in peril of extinction. There are many species of eagles throughout the world, but only two are found in the United States — the bald eagle and the golden eagle. Golden eagles are known to nest in many areas of western Nebraska and may be seen throughout the year, while bald eagles are more abundant in the state during the winter. Bald eagles require a relatively large amount of food. Therefore, areas such as those below Central’s hydro plants are attractive to eagles because of the abundant and readily available supply of one of their favorite foods — fish. During the winter, when ice forms on area lakes and rivers, bald eagles and many species of waterfowl concentrate in areas where open water can be found. Because of turbulence created by the action of the hydroplants, the water immediately below the plants remains open and is a favorite fishing spot for the eagles. Bald eagles can be scavengers, carrion-eaters, bandits, fishermen and proficient predators. Circumstances and the availability of food dictate how the bald eagle obtains food. While known for their opportunistic and bandit-like behavior, the bald eagle is also an effective predator when circumstances require. They are adept at capturing fish as small as shad or as large as a six-pound carp. Instead of folding their wings and diving like an osprey, they swoop in low and flat and dip their talons just below the surface to grab a fish. Eagles that congregate near Central’s hydroplants are likely to be capturing shad, alewife and other small fish, although larger fish, such as catfish and carp, are occasionally plucked from the water. Eagles also prey upon small mammals — particularly rabbits — and many species of birds, including ducks, geese and gulls. While injured birds are more likely to fall prey to eagles, full-grown, healthy waterfowl may become targets in the absence of more readily available food. In instances where there is a plentiful supply of fish (as is normally the case at J-2 and Kingsley Dam), the waterfowl generally display little concern over the presence of the big birds of prey. A bald eagle pair nested and fledged two young along the Loup River, the first documented case of a successful eagle nest in Nebraska since the 19th century. Successful nests have been reported each year since 1992 and, as numbers increase, it is hoped that such occurrences will become more common in Nebraska and that the state will have a permanent bald eagle population. 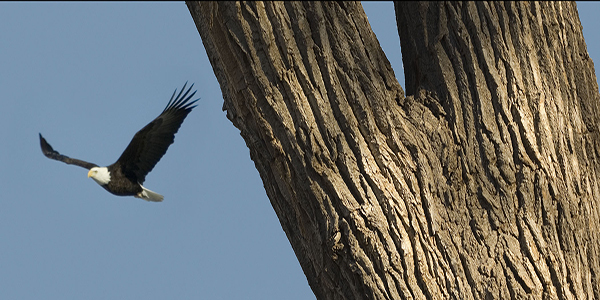 Most bald eagles seen in Nebraska during the winter have migrated from the northern United States and Canada. Migrating bald eagles may be seen in Nebraska as early as October and as late as May, but the location and duration of stay is dependent upon the weather and availability of food. Bald eagles do not display adult feathers until they are about five years old. Dark eagles seen near the hydroplants are probably young or immature bald eagles, although they may be golden eagles; the two are not easily discernible by casual observers. In Nebraska, bald eagles prefer to remain near water, especially if trees in which they can perch are nearby. Golden eagles are likely to be found in remote open areas where they hunt small animals and birds. Adult bald eagles are 35 to 40 inches long, weigh between eight and 14 pounds and have wingspans of six to eight feet. An adult golden eagle is similar in weight, 30 to 41 inches long and has a wingspan of about seven and a half feet. Typically, females of both species are about a third larger than males, which is common among most birds of prey. Good Morning! Both of our facilities are heated and with seating and restrooms available as well. You do not have to make a reservation for two people. 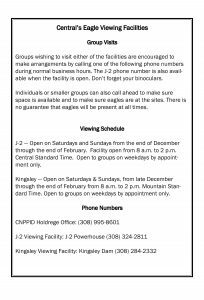 The facilities are open on Saturdays and Sundays from 8 a.m. til 2 p.m. and you may come and go as you please.